Hey northeast, it's winter! You know what that means... time to panic, buy all of the bread and milk you can find, and pretend that snow is a completely unknown terror. Or, you could do your normal grocery shopping and behave like a rational person who sees two feet of snow at least once every year. I'm not a fan of the way these typical winter storms are covered if you can tell. As it turns out (luckily), the "blizzard" was a bust for NYC and I went to work once the subway was back up in the morning on Tuesday, which is when JD and I shot these photos. Did I feel ridiculous standing in the middle of the snowy street without a coat on? Yes! I did. The few people walking by agreed. I got a few "what is she doing?" looks, but at this point I really don't care. It's funny how that has changed. This outfit may look familiar and that is because it is virtually a recreation of a snow day inspired compilation of some things I was "currently loving" back in November (see here). I ended up buying the shirt and snowballs featured and have basically been waiting for it to snow so I could wear it all together. I have been living in these boots lately / all week and am happy to report that they are extremely warm. In retrospect I should have been bringing a second pair of shoes to work instead of wearing them all day but they're just so cute and comfortable I don't want to. I wondered how you were doing with all the snow. I'm glad you are staying safe and warm! you are too cute. i am loving this weird warm weather we have been having lately (don't worry it's supposed to snow this weekend haha) but i wish we got a good storm! glad it wasn't quite the "life-threatening" blizzard they forewarned and that instead you just got a good beautiful snow! That first paragraph just made me chuckle. You're so right. People were out of control. I did enjoy the city being shut down for a while. No work, no traffic, no worries. The bars were packed and beer pong was the game of choice. Looks like you managed to get out & in a cute ensemble. Love, love, love how you layered! You have quite the knack for that :). If we had anywhere near two feet of snow in NC, we would be shut down at least for a week haha. But so far, no real snow this year yet! Just a few random flakes. Hoping for at least one snow day! And I love your look! Love this coat. Also, I'm always jealous of people in Sorels because they're such a silly purchase for me in Southern California. That being said, I'm obsessed with them! 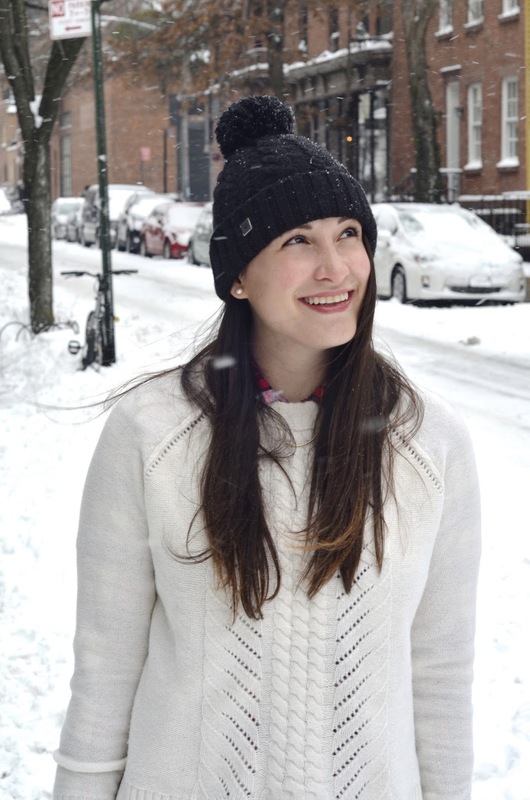 This is the perfect winter look! Love your layering! 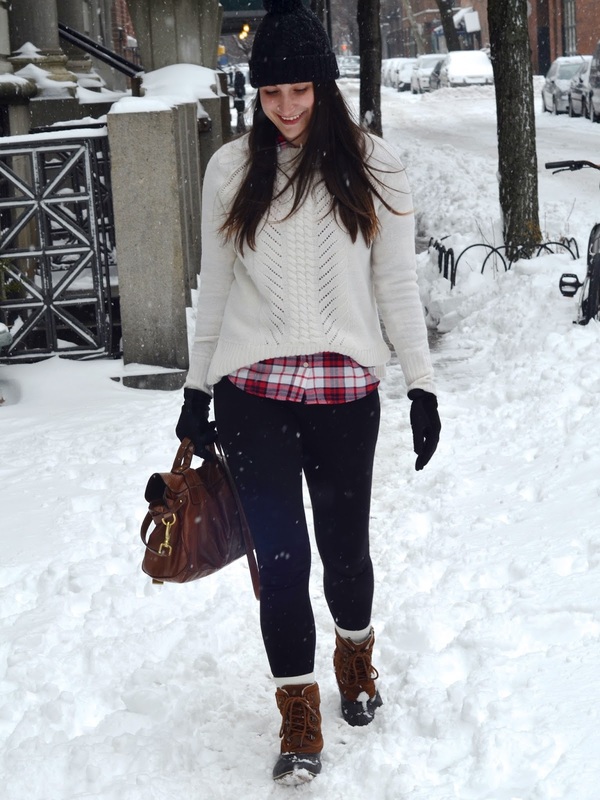 Only you could look perfectly put together and adorable in a snow storm- love this! Great winter look! 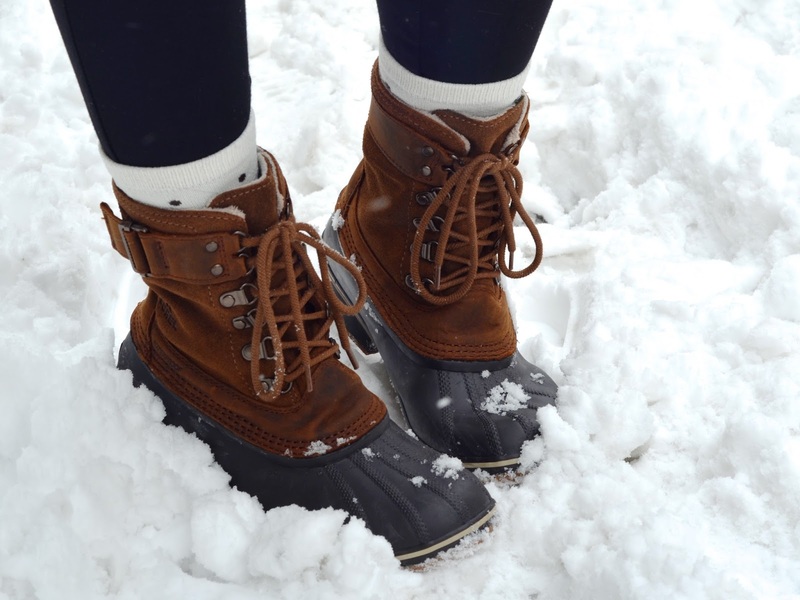 If I lived somewhere with snow, I would wear your boots all of the time! Loving the sweater/shirt combo, super cute. I totally feel the same way about the weather coverage, it's like people forget that winter happens every year. OMG girl! Look at all of that snow! It's so pretty!! Kinda jealous... it's cool out down here but definitely no snow. I think FL would shut down haha! Gorgeous!